Unified Contact Center Reporting: Which Metrics Matter? Doesn’t that depend on who you are, what your job function is and what industry your business is in? There are white papers that state which metrics are the top 20 and there are articles referencing the benchmark target for the top 5 – 10 metrics. Yet many of us still wonder which metrics are relevant to agents and managers and for the different groups within our business. There is a difference between real time alerts and historical metrics. A real time alert is a notification to the agents, supervisors and managers that report of a KPI that has exceeded its threshold. These threshold alerts are typically: Calls InQueue, Longest Wait Time, ASA, Agents Available, Service Level, Abandonment Rate, Tickets Waiting, Chats InQueue, Emails Waiting, etc. Real time alerts are to increase revenue and improve customer satisfaction. Historical metrics are reports that managers and agents review to see the overall performance for the group(s), call center, or the agent themselves. The debate is which metrics are most important to your report and it will depend on the industry and the group you are reviewing. 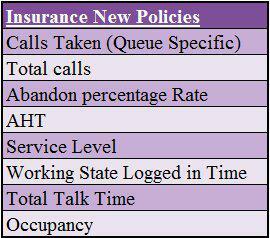 For example, here are two sets of metrics for an insurance company one set is for New Customers the other set is for Policy Cancellation. Both sets are for the group level. New Customers represent revenue and Policy Cancellation represents lost revenue. 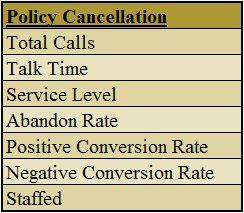 However, improving performance within the Policy Cancellation calls will have limited affects on customers wanting to cancel. Another example of the difference between groups is in Customer Service managing trouble tickets / support tickets. One group handles calls, chats and emails from Gold Level customers and the other group handles free support. Chat and Email metrics can be difficult to obtain, depending on the systems in place. With the Gold Level CS some of the metrics are compared against goals while the Free CS wants to know how high these metrics will go. Abandon Rate for the Gold may have a threshold level of 7.5% while the Free CS does not have a threshold setting it is just important to know what the abandonment rate is. The up / cross sell rate is an important metric for the Free CS reporting. A senior level manager from a Fortune 100 Mutual Fund Company “…any wait time over 10 seconds is a historical call…” what was meant by this comment was a new customer call that has a wait time over 10 seconds will be abandoned and a lost sale. The productive and non productive states are agent level metrics totaled and summarized for the groups to see the productivity by the agents. 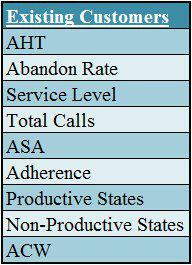 Agent labor costs are high for revenue producing financial call centers, however, lost calls is also lost revenue. Therefore tracking the productivity of agents is part of the managers summary level reporting. There are other metrics that are reported separately when accurate data is available. Call Backs: Call back accepted, call back made and conversion rate on call back. Metrics for agent level reporting will slightly vary based upon the industry, department, agent position and seniority level. To be clear this is a report for the manager that is regarding the agents. Again the industry and the department the business and agent are in should define the metrics that manager needs to review. An example of data requested from two managers one is an Outsourced provider selling products for its client. The other is a Customer service provider managing support calls, chat and logged in tickets (email interaction could not be reported). The manager report metrics is affected by many factors as have been mentioned. There are other factors that change the reporting metrics. What are the goals for the call center / group / department / agent? What is the agent turnover ratio? 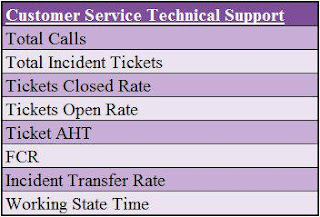 What is the product and or service failure ratio? There are many internal challenges that can change the report metrics. When going one level deeper to learn the agent level metrics the report needs to be more historical and over a longer period of time. The reports can be used for performance review, training recommendations, job security, position changes (advancement or reductions) or responsibilities. Agent level reports should include all groups (queues) the agent works for and not just one group. The agent level report should also be historical over different lengths of time. Report times should be the same for all agents to prevent a report that makes someone look very good or very bad. Performance can be: Yesterday, week ago, one month, three months, six months, nine months and one year. Some may want a report that is monthly because of their cyclical time is different from others. Outsourcers usually have reports that are monthly so they are able to show the client or corporate how the call center has performed and how specific agents have performed. The purpose for this report is the justification of the call center being outsourced or in a global location different from headquarters. There are many articles and white papers that show the metrics that you should have in your manager level reporting. Rather than follow the list in the latest article review your corporate goals, create reports for the different groups/departments, think about your goals and what you are trying to accomplish for the call center. And if you are a remote center the reports can be used for justification of your center. Build the report that will most likely fit your needs and answer your questions about agent, group and overall performance. The metrics that are shown above all come from customer requests. 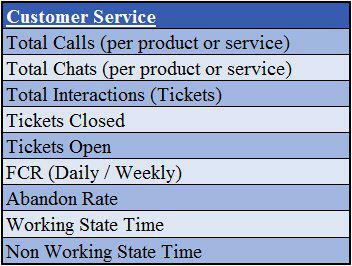 There are a number of metrics that are never asked for by many contact center managers. CSat: Customer Satisfaction ratings. 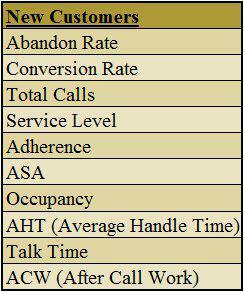 This is a valuable KPI that should be included yet is not requested or seen in many reports. Some do not conduct surveys, some surveys are found to be only very negative or very positive neither of which is a true rating of the center and some surveys are not relevant. 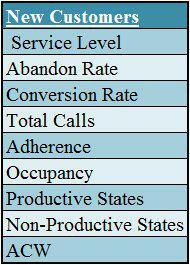 Cost/Call: Depending on the contact center Cost/call can be meaningless or extremely important. 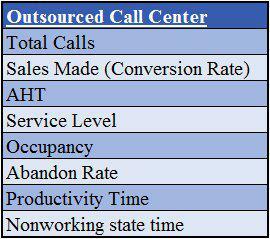 Is the center a BPO or outsourced center? Are there specific customers that are tracked and cost justification needed? Are separate groups tracked for line justification? Shrinkage: Some will track the productive (working) and non productive (non-working) states, while others will not but will track shrinkage. Shrinkage, vacation, lunch, holidays, time off, training, etc. are all considered shrinkage. There are some who will not consider certain states as part of shrinkage because of mandatory needs. Some centers may require high level agents have licenses which has the agent taking tests, attending a class, etc. The agent themselves may argue that this is an extremely important part of their position and therefore should not be considered shrinkage or a non productive state. Quality: Call quality can quickly define the CSat scores for the agent. However, quality is subject to interpretation by the reviewer and can be an ineffective/inefficient metric. Who is reviewing the quality and quality scores can also affect the interpretation of the scores. A manager who has the same experiences should be the one that is reviewing the quality scores and agent effectiveness and efficiencies. Tracing: Agent tracing per call and / or for a segment of the day has become important to some supervisors and managers. True agent state per call or segment of the day is a much better status reporting then agent states numbers for the day or week. 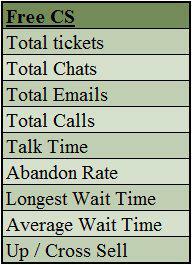 The difficulty with this metric is the availability of it from the PBX. Also the availability of the data from voice / email /chat can be a challenge. Some of the metrics mentioned may not fit your needs or goals. AHT for some is a waste of reporting efforts and time. Why bother reporting on something that is not accurate, has no value or can easily be changed by the agent if it is used against them? Your contact center goals are the key to the metrics that are required in your reports. Do not look at these report lists and assume these are the one you must have. Spectrum is a leading provider of Unified Contact Center Reporting. 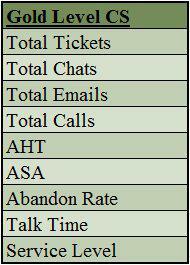 Contact Spectrum today to learn more about metrics for your contact center. If there are terms in this document that you wish to know more about feel free to contact me for more information.